Bessie is a documentary filmmaker and long term environmental activist and advocate for sustainable living. 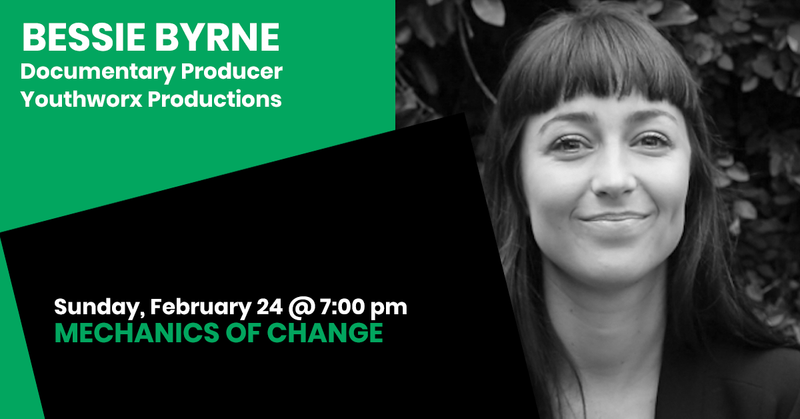 She first became interested in documentary as a vehicle for change when doing her undergraduate in communications and working for various environmental groups around Melbourne. She has a sound understanding of how human induced climate change is devastating our planet, and is a passionate believer that people can make a difference when we work together. Bessie is the producer of the documentary Tunnel Vision (2016, Aus) and has portfolio of short films and broadcast productions. In 2018, Bessie co-founded Brunswick Friends of Forests. Previously, Bessie was one of the organisers of The Environmental Film Festival of Australia (EFFA) where she focused on film programming and producing the Reel Impact Industry Development Conference. She currently works at Youthworx Productions, a social enterprise film production company that creates impactful films while providing work opportunities to young people experiencing or at risk of homelessness.